Spring means flowers blooming, bees buzzing, sun filled days, and family gatherings. It also means giving the house a good cleaning. Spring cleaning though is not just for the inside of the house. There is also the yard to consider. By scheduling time for spring yard cleanup, you will be assured a landscape that looks great, and adds curb appeal. Use these tips to get started. Clean Up – It almost goes without saying, but it’s important to clean up the leaves, sticks and other debris that may have accumulated over the fall and/or winter seasons. If there is a lot of foliage scattered on your yard, sidewalks and driveways, use a leaf blower. In addition to giving your yard a neat and tidy appearance, removing debris makes it safer to use your lawn mower, and gives you a bird’s eye view of any damage caused by old man winter. Pull Weeds – Grass and weeds are in constant battle for precious real estate in your yard. Probably the easiest way to kill weeds is to keep them from gaining a foothold. Use a pre-emergent herbicide to prevent weeds from germinating in planting beds and lawns. Once they’ve sprouted, pulling them by hand improves your odds of removing the entire root. It pays to remember that time is critical. Prune – With the proper technique, pruning promotes good plant health, resulting in a vigorous burst of new growth. A good starting point is to remove dead, diseased or damaged stems as you see them; ideally before they push out new growth. You should additionally prune any weak growth. When pruning, always start at the top and work your way down, enhancing the health and beauty of your landscaping plants. Add Color – Early spring is a rewarding time to plant trees, shrubs, and annuals. For an instant pop of color, consider planting flowering bulbs, such as daffodils and tulips. Seedlings can be planted in garden beds or popped into large pots. Remove plants that have died or are unhealthy. When deciding where to place a new plant, it’s important to consider the amount of sun it requires, as well as the space that’s needed. Clean Outdoor Furniture – Warmer weather means more time spent outdoors – eating, relaxing, and entertaining. Make a point of cleaning your outdoor furniture regularly to prevent it from becoming weathered and faded by the elements. Nuts and bolts should be checked and tightened. Replace any furnishings that are unstable, torn or rotted. Clean paved surfaces and hardscapes. The results of spring cleaning the yard. With spring on the horizon, many homeowners are finding themselves revamping their homes, cleansing them from the dreary effects of winter. This time of year brings with it the opportunity to throw open the windows, let some much needed air in and make our homes both beautiful and healthy. But spring cleaning doesn’t end inside the home! Your home’s exterior can benefit from some much needed spring cleaning as well. Sure your yard’s growing season may have been on a hiatus, but that doesn’t mean there’s no work to do. You may notice your yard has accumulated quite a bit of debris and dead growth which will need to be cleared prior to your new growing seasons’ start. Did this winter’s wind and cold do a number on your yard? Then you may want to start your spring cleaning efforts by taking out your forgotten rakes and uncovering any plants that may have been sheltered during the winter. You will additionally want to clean out all of your planting beds to ensure the removal of built-up debris. As you are removing debris and leaves, make sure to pay close attention to detail, as to prevent harming any tender new growth. You will also want to prune any old or dead growth from your existing plants, trees and shrubbery to provide them with room to grow. This helps shape your plants as well which can extend their lifespan. Using a spade or a rototiller work the soil in and around the area’s where you will be placing new plants. Tilling oxygenates the soil! During the entire course of your spring cleaning the yard, you will want to watch for any insects so as to avoid the possibility of an infestation during your growing season. While spring cleaning the yard can take considerable resources it is however something you will enjoy long after its completion. An ignored yard is not a pretty site! Once you’ve completed all the aforementioned techniques, you can then, and only then start planting. For the best results make sure you check the planting information on your new purchases. 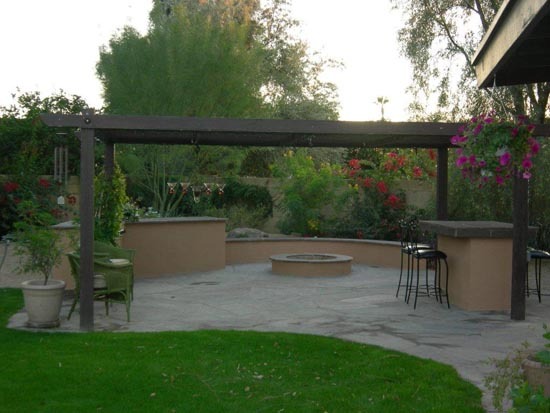 Since 1982, Elite has been providing the highest quality landscaping services including spring cleaning in the yard, to the greater Phoenix area. We work with all clients, both big and small, so call us today at (602) 340-4645 anytime you need a reliable hand.